Northeastern Naturalist Vol. 24, No. 1 R. Ibe 2017 25 2017 NORTHEASTERN NATURALIST 24(1):25–36 Late-Glacial Vegetational History of the Edmund Niles Huyck Bog, Rensselaerville, New York Ralph Ibe* Abstract - Pollen analysis of a 10-m core from the Niles Huyck Bog in Rensselaerville, NY, yields a history of late-glacial and postglacial vegetational change from the beginning of sediment deposition into the bog basin following ice withdrawal to the present. A radiocarbon- dated sequence is provided as time control for the upper 6 m. Late-glacial pollen assemblages seen near the base of the core consist of Abies spp. (fir) and Picea spp. (spruce) as the principal tree genera and grasses and sedges as the main herbaceous components, and resemble pollen assemblages elsewhere in New York and New England. These assemblages were replaced by ones consisting primarily of Pinus spp. (pine), which became dominant ca. 9000 years before present (YBP). By 8000 YBP, pine gave way to Tsuga canadensis (Eastern Hemlock), Quercus spp. (oak), and Fagus grandifolia (American Beech), denoting a more mesic climate. Thereafter, the replacement of oak by beech is a notable trend that continues throughout the pollen profile and is interrupted only by the hemlock decline at 4723 YBP. The pollen spectra then begin to reflect vegetation of a more local character, and ca. 3000 YBP the beginning of the closure of the catchment basin is marked with the sustained increase of Sphagnum spp. (sphagnum) spores. An Ambrosia spp. (ragweed) pollen signal marks European settlement near the top of the core. A pollen signature near the base of the core (Zone H-2) suggests a Younger Dryas (YD; 12,900–11,300 YBP) cooling event for this region, making the sediments below probably equivalent to the Allerød Interstadial for the Niles Huyck Bog. The date for this event is ca. 13,000–14,500 YBP. An estimated date of 14,344 YBP is based on the time needed to accumulate the last 60 cm of sediment and adding it to the end of the YD. This date is in close agreement with the dates recorded for both the nearby Meadowdale Bog and the Great Bear Swamp and supports the hypothesis of a “bottom to top” mode of deglaciation in this region. 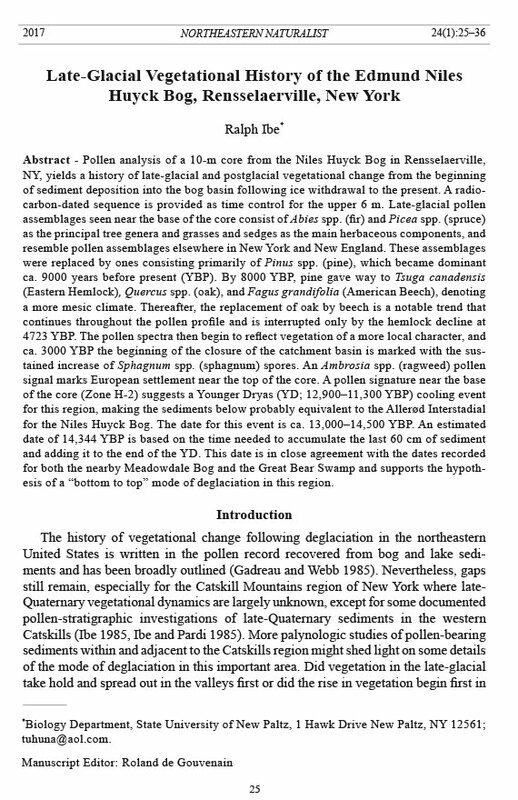 Introduction The history of vegetational change following deglaciation in the northeastern United States is written in the pollen record recovered from bog and lake sediments and has been broadly outlined (Gadreau and Webb 1985). Nevertheless, gaps still remain, especially for the Catskill Mountains region of New York where late- Quaternary vegetational dynamics are largely unknown, except for some documented pollen-stratigraphic investigations of late-Quaternary sediments in the western Catskills (Ibe 1985, Ibe and Pardi 1985). More palynologic studies of pollen-bearing sediments within and adjacent to the Catskills region might shed light on some details of the mode of deglaciation in this important area. Did vegetation in the late-glacial take hold and spread out in the valleys first or did the rise in vegetation begin first in *Biology Department, State University of New Paltz, 1 Hawk Drive New Paltz, NY 12561; tuhuna@aol.com. Manuscript Editor: Roland de Gouvenain Northeastern Naturalist 26 R. Ibe 2017 Vol. 24, No. 1 the upper reaches of the mountains? In other words, did ice leave the valley systems first, or did deglaciation begin first from the summits? Rich (1934) contended that at least some of the higher Catskill summits stood out as nunataks during the last full glacial period, and that evidence of glaciation (e.g., erratics, glacial striae) above 1189 m on Slide Mountain, for example, is entirely lacking. It is uncertain whether the higher Catskill summits provided a focal point for the spread of late-glacial vegetation or whether the early forests spread north through major deglaciated corridors, perhaps the Wallkill and Hudson Valley systems. One approach to determine whether the mode of deglaciation was “top to bottom” or “bottom to top” is to provide radiocarbon dates marking the beginning of sedimentation in lake and bog sediments. Unfortunately, sufficient organic material for radiocarbon dating is not available in most basal sediments, but Peteet et al (2012) has shown that many lakes and bogs contain macrofossils for accelerator mass spectrometry (AMS) dating in basal clays that have less than 10% organic matter. They suggest that many sites need to be revisited with a view to examining the macrofossil data for AMS dates. This paper focuses on the Niles Huyck Bog sediments in close proximity to Meadowdale Bog, elevation 105 m and ~5 km to the northwest, and in Great Bear Swamp, elevation 370 m and ~3 km to the east (Dineen 1986). A comparison of basal sediment dates from these sites should provide an almost contiguous series of data points on which to make some tentative conclusions related to the mode of deglaciation in this region. Site Description The Niles Huyck Bog, elevation of ~560 m, is located on the Rensselaerville, NY, USGS topographic quadrangle, 7.5-minute series (42°54'76"N, 74°18'10"W) and lies just outside the boundaries of the Niles Huyck Preserve (Fig. 1). The bog itself is covered completely by sphagnum moss and supports the usual variety of bog vegetation, including Drosera rotundifolia L. (Sundew) and Sarracenia purpurea L. (Pitcher Plant). Some dense stands of common Ilex verticillata (L.) A. Gray (Winterberry) and Acer rubrum L. (Red Maple), and invading Betula spp. (birch) are common associates. The periphery of the bog is dominated by members of the Osmundaceae and by polypodiaceous ferns. The surrounding area consists of rolling hills which have been cut over several times in the past for the establishment of farms, but the native Pinus strobus L. (White Pine), Tsuga canadensis (L.) Carrière (Eastern Hemlock), and hardwood forests are making a comeback in several areas, such as the Partridge Run Game Management Area. Bedrock is principally Helderberg limestone overlain with Catskill deltaic sediments (Broughton et al. 1966). Methods I used a Livingstone sampler to raise a 10-m sediment core from the deepest part of the Niles Huyck bog, as ascertained by repeated test borings. Samples for pollen analysis were taken at 10 cm intervals along the length of the core, placed in plastic containers, and frozen pending processing. Radiocarbon age determinations were performed by Beta Analytic, Inc., Coral Gables, FL, on samples collected at 1.0-m Northeastern Naturalist Vol. 24, No. 1 R. Ibe 2017 27 intervals from the top of the core to a depth of 6.0 m. These determinations provide time horizons that intersect vegetational events through time and form the basis for the calculation of sediment accumulation (Fig. 2) expressed as years per centimeter (yr/cm) and were derived by dividing a core section (in cm) by the number of years spanning its deposition. The latter was calculated by taking the difference in years between radiocarbon dates that bracket the section, and then dividing the remainder by the section length. It should be pointed out that sediment accumulation varies with changes in lithology, compaction, and hydrology, and hence the results are only approximations. Pollen analysis I thawed and processed sediment samples following standard acetolysis procedures (Faegri and Iversen 1975). This process included hydroflouric acid (HF) treatment when appreciable sand was present, followed by acetolysis, safranin staining, and mounting in glycerin. Large amounts of clay were first treated with 7% sodium pyrophosphate prior to acetolysis (Bates et al. 1978). Pollen was concentrated on microscreens before being mounted on slides (Cwynar et al. 1979). I tallied at least 300 pollen grains from each slide to form the basis for the relativefrequency histogram. Relative spore frequency is based on the pollen sum plus the number of spores tallied in the course of counting the pollen. I identified both pollen and spores by comparison with a modern reference slide collection and with taxonomic keys provided by McAndrews et al. (1973). I conducted pollen counting Figure 1. Portion of the USGS Rennselaerville Quadrangle indicating the location of the coring site (“drill site”) at the Niles Huyck Bog. Northeastern Naturalist 28 R. Ibe 2017 Vol. 24, No. 1 routinely at a magnification of 400x (n.a. = 0.6) using an A.O. Spencer binocular microscope. Critical identification of problem types was made under oil immersion at 1000x (n.a. = 1.25). Pollen diagram I constructed a relative frequency (%) histogram of the pollen taxa for the Niles Huyck Bog (Fig. 3). Pollen frequencies of each taxon were plotted against depth and arranged into 3 major groups: Arboreal pollen from trees and shrubs (AP); non-arboreal pollen from terrestrial and aquatic herbs (NAP); and spores from sphagnum and vascular cryptogams. The value of each taxon is expressed as a percentage of the sum of the AP + NAP pollen counts, including spore types. Values of 2% or less are shown as a tic mark. Percentage amounts for each taxon appear on the “x” axis. Lithological column and depth coordinates appear on the left of the diagram, as do the radiocarbon dates. Pollen zones appear on the right. Corrected radiocarbon dates became available after the diagram was finished and appear as cal. kyr BP in Table 1. Results Sediment accumulation Dates plotted against depth (Fig. 2) show considerable variation in sediment accumulation along the top 6.0 m of the core. Accumulation is slowest in clay Figure 2. Plot of corrected radiocarbon age determinations and sediment depth for the Niles Huyck Bog. The sediment deposition is expressed in yr/cm. Northeastern Naturalist Vol. 24, No. 1 R. Ibe 2017 29 Figure 3. Radiocarbon-dated pollen histogram for the Niles Huyck Bog, Rensselaerville, NY. Northeastern Naturalist 30 R. Ibe 2017 Vol. 24, No. 1 (22.4 yr/cm) between 5.0–6.0 m and fastest in peat (5.2 yr/cm) between 2.0 and 3.0 m. The beginning of sediment deposition is unknown but can be roughly estimated by examination of the pollen signatures associated with well-dated events and inserting these dates into the lithological column for comparison with work done in nearby sites. Pollen frequency diagram The relative pollen frequency diagram for Niles Huyck Bog (Fig. 3) is divided into 8 horizontal zones depicting pollen assemblages believed to represent major vegetational shifts in the dominant vegetation. Zone H-1 marks the change in lithology from clay to sand that occurs around 9.4 m. There is a heterogeneous mixture of pollen from fir, spruce, pine, birch, oak, and hemlock as well as herbaceous pollen from the sedges and grasses, which is compatible with a warming trend seen in the Allerød Interstadial. Zone H-2 witnesses a distinct increase in herbs, mainly sedges and grasses, and a marked drop in oak pollen in the profile. The Alnus (alder) pulse, while small, is distinct and, together with the decline in birch and pine, seems almost certainly a Younger Dryas (YD) pollen signature. Zone H-3. Herbaceous pollen from grasses and sedges drop precipitously. Fir reaches a maximum while spruce declines to 0% at the upper boundary of this zone. Pine begins to increase here (to ~25%), with concomitant declines in birch, hemlock, and oak. Zone H-4. A pine maximum is registered near the base of this zone but declines soon after while giving rise to a distinct oak maximum. Near the upper half of zone H-4 there is a pronounced rise of hemlock and Fagus grandifolia Ehrh. (American Beech) pollen that is accompanied by a decline in oak pollen and that signals more mesic conditions. Zone H-5. This zone embraces maximum hemlock pollen (~40%) throughout the lower half of the zone that abruptly declines to its lowest values throughout the core and marks the hemlock decline seen throughout the Northeast. Oak values retreat from their maxima seen in Zone H-4 along with a sharp reduction in pine pollen. Beech pollen shows a steady increase reaching a maximum of nearly 20% near the top of Zone H-5. Zone H-6. Pine and hemlock slowly recover from their previous lows but never attain their former high values, while beech drifts somewhat lower to the top of Table 1. Uncorrected radiocarbon dates appear as 14C YBP; corrected dates appear as cal. kyr BP. The depth in meters for each date appears in the column on the left. Depth (m) 14C YBP cal. kyr BP 1 1450 ± 70 1364 ± 155 2 2840 ± 50 2953 ± 165 3 3240 ± 80 3471 ± 157 4 4170 ± 120 4688 ± 317 5 5650 ± 110 6450 ± 203 6 7830 ± 190 8693 ± 419 Northeastern Naturalist Vol. 24, No. 1 R. Ibe 2017 31 the zone. Red Maple attains a presence not seen throughout the entire core, while other deciduous trees such as ash, elm, and other maple spp. are well represented. Herbaceous and aquatic pollen attain values in this zone that are their highest in the entire core. Zone H-7. Slight increases in birch, pine, and hemlock pollen are evident in this zone, and deciduous pollen from maple, ash, elm, hickory, and basswood take on a more local character before giving way to the land-clearing practices of early European settlement. A very high peak of ~60% Sphagnum spp. (sphagnum) spores at 2.7 m marks the closing of open water in the bog. Zone H-8. A high Ambrosia spp. (ragweed) peak at the top of the core together with the disappearance of hemlock, beech, maple, ash, elm, hickory, and other hardwood species marks the beginning of European settlement and intense farming activities in this area. Discussion Deglaciation in the Rensselaerville area and surrounding region probably occurred as a patchy quiltwork of downwasting, stagnant ice (Dineen 1986). The clay/sand lithology at the base of the core is consistent with this scenario of glacial wastage, and was probably deposited by low-velocity meltwater derived from residual stagnant ice. Bottom sediments of the Niles Huyck Bog were organically poor, and the age for this depositional episode cannot be established with certainty, although the YD pollen signature seen in Zone H-2 places an age boundary between 12,900 and 11,300 YPB. If this is reliable, then lower sediments seen in Zone H-1 would be the equivalent to the Allerød warming event occurring around 13,000- 14,500 YBP but may even be older if the sediments also include part of the Older Dryas Interstadial. Projecting the accumulation values for clay seen in Figure 2 (22.4 yr/cm) from the lower boundary of the presumed YD to the base of the core (9.4–10.0 m) yields a value of roughly 1344 years to accumulate 60 cm of clay. Adding this figure to the beginning of the presumed Allerød warming event yields an estimated date of 14,344 YBP for the beginning of sediment deposition into the Niles Huyck bog. Basal sediments from nearby Meadowdale bog near Voorheesville, NY (42°39'36"N, 73°59'07"W), yield a radiocarbon date of ca. 16,650 YBP. An extrapolated date for basal sediments from Great Bear Swamp, 5 miles west of the Alcore Reservoir (42°28'45"N, 74°03'15"W) places the beginning of sediment deposition ca. 15,060 YBP (Dineen 1986). These dates are not in close agreement with the estimated date of 14,344 YBP for Niles Huyck Bog but are considerably older than a previously estimated age of 13,800 YBP for deglaciation in this region (Connally and Sirkin 1973). The extrapolated date of 13,380 YBP for basal sediments at Balsam Lake in the western Catskills (Ibe 1985), the 12,870 ± 370 YBP dated bottom sediments in the higher reaches of the White Mountains of New Hampshire at Lost Pond at 650 m elevation, and the 13,000 ± 400 YBP dated sediments at Little Lost Pond at 800 m elevation (Davis, et al. 1980), tentatively places younger dates for bottom sediments at higher elevations and older dates for corresponding basal sediments at low-relief positions. However, these dates were Northeastern Naturalist 32 R. Ibe 2017 Vol. 24, No. 1 provided at a time when AMS dating procedures did not exist, and these sites need to be revisited with new dating methods. Nevertheless, the data suggest that glacial wastage occurred first in the lower regions of the Northeast and that ice in the higher montane areas disappeared sometime later. The apparent trend in glacial meltdown from “bottom to top” (see Connally 1982) has important implications with respect to early centers of plant dispersion following ice withdrawal, and does not support the theory that the higher reaches of the Catskills and elsewhere may have served as active refugia from which late-glacial forests began. Most late-glacial and postglacial plant-migration patterns have been amply described (see Delcourt et al. 1983, Webb 1980), but whether early plant colonization and migration were supplemented, or even dominated, by existing montane refugia flora is unknown. An inventory of basal sediment dates for remaining high altitudes and low-relief positions within the Catskill region would be extremely helpful in resolving some aspects of the dynamics of glacial meltdown and plant immigration patterns for this important area. Identification and AMS dating of macrofossils collected in bottom sediments would be a very useful proxy in this regard (Peteet et al. 2012). The pollen stratigraphy for Niles Huyck Bog shows a postglacial pollen sequence that is similar in many respects to pollen spectra reported for most of the Northeast (Gadreau and Webb 1985). The incorporation of a well defined spruce–fir–grass– sedge assemblage within the bottom 2-m sediment section of the core is evidence for a park-tundra vegetation already present at the site when sediment deposition first began, and typifies a recently deglaciated landscape capable of supporting arboreal species with pronounced lateral root development (recently deglaciated landscapes would have thin soils capable of supporting trees that spread roots laterally rather than vertically). Pollen evidence for tundra landscape (e.g., Dryas) preceding park-tundra is not recorded in the pollen stratigraphy and may have been obscured by a time lag between warming and ice wastage. The disappearance of residual ice long after conditions optimal for tundra vegetation had changed from cold to warm may account for the lack of a distinct T (tundra) zone. The appearance of abundant pine, oak, and birch at this level in the core is probably due to longdistance wind transport from more southerly areas where these genera were already established (Sirkin 1967). The high percentage of mixed coniferous–deciduous pollen seen at the base of the core is unusual because of the lack of chronological or successional sequences among these genera, and analogs for this spectrum are lacking in present-day forests. One explanation for this anomaly is that very little canopy existed during the early depositional period for this basin. High percentages of grass and sedge pollen found at the base of the core are typical of an open canopy where the filtration effect on long-distance wind-transported pollen would be minimal. The appearance of oak and pine pollen in Zone H-4 signals a shift in climate from cold and wet to warmer and drier conditions. Rapid replacement of fir and spruce pollen by a rise in pine pollen ca. 9000 YBP in the Middle Atlantic and New England States (Gadreau and Webb 1985, Ibe 1985) persisted for nearly 2000 years until the vegetation became dominated by a mixed hardwood forest. Application of the sediment accumulation rate of 22.4 yr/ Northeastern Naturalist Vol. 24, No. 1 R. Ibe 2017 33 cm between 5 to 6 m yields a date of ca. 9500 YBP for the pine maximum at the Niles Huyck Bog. This extrapolated date concurs with the B (pine) zone at Great Bear Swamp and Meadowdale Bog, and indicates that sediment accumulation for the interval of time between 8693 ± 419 cal. kyr BP (Fig. 2) and the pine maximum were probably accurate. Thereafter, hemlock and beech pollen became prominent, signaling more mesic conditions. The hemlock “crash” is evident at around 4723 YBP and is in agreement with other clusters of dates in the Northeast marking this event (Gadreau and Webb 1985) but occurred somewhat later (4180 Y BP) at Sutherland Pond in the Hudson Highlands Maenza-Gmelch (1997). Decimation of hemlock appears to have occurred in a remarkably short period of time, spanning an interval of about 900 years, from 4100 YBP at Rogers Lake, CT (Davis 1967), to almost 5000 YBP in New Hampshire (Davis et al. 1980). The ubiquitous and sudden decline of hemlock pollen in most pollen diagrams throughout the northeastern United States and Canada has stimulated several theories to explain this event. Miller (1973) postulated drought as a causative agent in hemlock mortality because hemlock’s shallow root system is vulnerable to prolonged periods of dryness. He cited as evidence the severe damage to hemlock during the 1930s drought described by Secrest et al. (1941) who showed extensive damage to hemlock in the 93,078- ha (230,000-acre) Menominee Indian Reservation in Wisconsin between 1931 and 1933. Elsewhere, hemlock tree mortality reached 75% as a result of drought in an area near New Haven, CT (Stickel 1933). In a comparative study of the effects of severe drought on different tree species in central Pennsylvania, McIntyre and Schnur (1936) showed that hemlock mortality was much higher than that of either oak or Acer saccharum Marshal (Sugar Maple). Davis (1981) contends that the hemlock “crash” may be attributable to the spread of disease rather than to climatic change. Davis reasoned that the abruptness of the decline followed by the coordinated increases in other mesic species (e.g., beech), argued for a biological explanation, perhaps disease or insect attacks which were selective for hemlock. Indirectly supporting Davis’s theory of insect attack is work done by Booth et al. (2012) who showed beech vulnerability to drought in Michigan during the Medieval Climate Anomaly (MCA) that took place between 1050 and 600 BP. Pollen diagrams of the northeastern United States do not show a decline in beech during the hemlock crash, and if the hemlock decline was due to drought, then this should be reflected in a coeval decline in beech. Shuman et al. (2004) suggest that climatic changes toward drier conditions weakened hemlock and made it more susceptible to phytophagous attacks. Further south in the “sky lakes” of the Shawangunk Mountains of southeastern New York, a date of 4770 14C yr BP has been assigned to the sudden hemlock collapse at Lake Minnewaska (Menking et al. 2012). The hemlock crash is a conundrum that is in need of a conclusively substantiated explanation. Arboreal pollen spectra in more recently deposited sections of the core that exhibit the hemlock decline show very little change in most of the major taxa represented. Pollen input from hemlock increases through the top 4.0 m of the core but never attains its pre-decline dominance. This pattern may be the result of competition with beech, another mesophytic species prominent in the spectra Northeastern Naturalist 34 R. Ibe 2017 Vol. 24, No. 1 at this time. Maple pollen never reaches values of more than 12–14% between 1–2 m, but this result can be misleading. Some recent studies of modern pollen rain–vegetation relationships in both the Catskill and Adirondack Mountains of New York (Ibe 1984, Ibe and Sperling 1986) and in New Jersey (Ibe et al. 1990) demonstrate that maple is grossly underrepresented in the pollen rain. Maple can play a subdominant role in the forest while contributing no more than 10% of the total pollen rain recovered locally. An increase in herbaceous and aquatic pollen followed by a large maximum from sphagnum spores just prior to the increase in maple pollen represents a shift from regional to local pollen rain and indicates a significant drop in the water depth favorable to the growth of aquatic vegetation. These changes no doubt contributed to a local environment favorable to the development of maple as an important component of the local forest composition in this area and accounts for the increase in maple pollen at this time. It is instructive to notice a maximum from pollen of Red Maple at the very top of the diagram (Fig. 3). This occurrence is a clear signal that the sphagnum bog from which the core was taken was now almost completely filled in enough to support certain trees, particularly Red Maple, which is typically found growing in the sphagnum mat, along with other species, notably larch. The uppermost 1 m of sediment features a dominant birch-pollen peak coeval with a noticeable increase from ragweed pollen from regional sources. These events are consistent with European settlement and agricultural clearing practices; birch is a pioneer genus whose abundant pollen reflects a recent invasion into abandoned farmland. In summary, the pollen record of the Niles Huyck Bog depicts a history of late-glacial and postglacial vegetational change similar in many respects to corresponding changes depicted in pollen diagrams for most low-relief positions in the northeastern United States. Sediment deposition into the Niles Huyck Bog probably began around 14,500 YBP. The clay/sand lithology at the base of the core suggests low-velocity deposition of sediments derived from ice stagnation and down wastage as a probable mode of deglaciation in this region. A well-defined spruce–fir–grass–sedge pollen assemblage between 8.0 and 10.0 m typifies cold, wet conditions indicative of park-tundra. Gradual warming encouraged the spread of pine and oak which became the dominant genera ca. 9500 YBP and remained so for more than 1000 years before giving way to hemlock and beech, signaling more mesic conditions ca. 9000 YBP. The hemlock “crash” seen in most pollen diagrams for the northeastern United States is in agreement with the time of the sharp hemlock decline seen in the pollen diagram for Niles Huyck Bog. Subsequently, bog-supported aquatics and herbaceous pollen provide a more local character to the pollen spectra, and oak, birch, maple, and other hardwoods are testimony to the stable mesic nature of the climate of this region. By ca. 2800 YBP, the pollen catchment surface of the bog appears almost completely closed off. Thereafter local pollen impacted onto the surface of the sphagnum mat was recorded as the sphagnum sank lower into the bog waters. The upper surface of the pollen record reflects land clearing by the appearance of ragweed, grasses, and sedges, and the disappearance or reduction of many arboreal species, such as oak, hemlock, Ulmus spp. (elm), ash, and pine. Northeastern Naturalist Vol. 24, No. 1 R. Ibe 2017 35 Acknowledgments This research was funded in part by the Edmund Niles Huyck Preserve Scientific Advisory Committee. The author thanks Dr. David Lemmon and 2 anonymous reviewers for their critical reading of the manuscript and their valuable feedback. Literature Cited Bates, C.D., P. Coxon, and P.L. Gibbard. 1978. A new method for the preparation of clayrich sediments samples for palynologic investigations. New Phytologist 81:459–463. Booth, R.K., S.T. Jackson, V.A. Soura, M.E. Sullivan, T.A. Mjnckley, and M.J. Clifford. 2012. Multi-decadal drought and amplified moisture variability droverapid forest community change in a humid region. Ecology 93(2):219–226. Broughton, J.G., D.W. Fisher, Y.W. Isachssen, and L.V. Rickard. 1966. Geology of New York: A short account. New York State Museum education Leaflet No. 20. Albany, NY. 44 pp. Connally, G.G. 1982. Deglacial history of Western Vermont. Pp. 183–193, In G.L. Larson and Byron D. Stone (Eds. ), Late Wisconsinan Glaciation of New England. Kendal/Hunt Publishing Co., Dubuque, IA. 242 pp. Connally, G.G., and L.A. Sirkin 1973. Wisconsinan history of the Hudson-Champlain Lobe. Geological Society of America Bulletin 136:47–69. Cwynar, L.C., E. Burden, and J.H. McAndrews 1979. An inexpensive method for concentrating pollen and spores from fine-grained sediments. Canadian Journal of Earth Sciences 16:1115–1120. Davis, M.B. 1967.Late-glacial climate in northern United States: A comparison of New England and the Great Lakes Region. Pp. 1–43, In E.J. Cushing and H.E. Wright (Eds.). Quaternary Paleoecology. Yale University Press, New Haven, CT. 277 pp. Davis, M.B. 1981. Outbreaks of forest pathogens in Quaternary history. IV. International Palynology Conference, Lucknow (1876–1977) 8:216–227. Davis, M.B., R.W. Spear, and L.C.K. Shane. 1980. Holocene climate of New England. Quaternary Reserves 14:240–250. Delcourt, H.R., P.A. Delcourt, and T. Webb III. 1983. Dynamic plant ecology: The spectrum of vegetational change in space and time. Quaternary Science Reviews 1:153–175. Dineen, R.J. 1986. Deglaciation of the Hudson Valley between Hyde Park and Albany, New York. Pp. 89–108 In D.H. Caldwell (Ed.). The Wisconsinan Stage of the First Geological District, Eastern New York. New York State Museum Bulletin 455. Albany, NY.192 pp. Faegri, K., and J. Iversen. 1975. Textbook of Pollen Analysis. Hafner Publishing Co., NY. 237 pp. Gaudreau, D.C., and T. Webb III. 1985. Late-Quaternary Pollen Stratigraphy and Isochrone Maps for the Northeastern United States. Pp. 247–280, In V.M. Bryant Jr. and R.G. Holloway, (Eds.). Pollen Records of Late-Quaternary North American Sediments. Published by the American Association of Stratigraphic Palynologists Foundation. 423 pp. Ibe, R.A. 1984. Modern pollen rain–vegetation relations at four different elevations on Slide Mountain, Catskill Mountains, New York. Bulletin of the Torrey Botanical Club 111:96–102. Ibe, R.A. 1985. Post-glacial montane vegetional history around Balsam Lake, Catskill Mountains, New York. Bulletin of the Torrey Botanical Club 12:176–186. Ibe, R.A., and R.R. Pardi. 1985. A radiocarbon-dated pollen diagram for Heart’s Content Bog, Green County, New York. Northeastern Geology 7:201–208. Northeastern Naturalist 36 R. Ibe 2017 Vol. 24, No. 1 Ibe, R.A., and J.A. Sperling. 1986. Vegetation–modern pollen rain relations on Whiteface Mountain, Adirondack Mountains, New York. Northeastern Geology 8:23–31. Ibe, R.A., R. Loeb, and J.A. Sperling. 1990. Tree-pollen relations at the Greenbrook Sanctuary, Alpine, New Jersey. Bulletin of the New Jersey Academy of Science 35:1–15. Maenza-Gmelch, T.E. 1997. Holocene vegetation, climate, and fire history of the Hudson Highlands, southeastern New York, USA. The Holocene 17:3–8. McAndrews, J.H., A.A. Berti, and G. Norris. 1973. Key to the Quaternary Pollen and Spores of the Great Lakes Region. University of Toronto Press, Toronto, ON, Canada. 61 pp. McIntyre, N.C., and G.L. Schnur. 1936. Effects of drought on oak forests. Pennsylvania State College Experiental Station Bulletin 325. State College, PA. 43 pp. Menking, K.M., D.M. Peteet, and R.Y. Anderson. 2012. Late-glacial and Holocene vegetation and climate variability, including major droughts, in the Sky Lakes region of southeastern New York State. Paleogeography, Paleoclimatology, Paleoecology 36:45–59. Miller, N.G. 1973. Late-glacial and postglacial vegetation change in southwestern New York State. New York State Museum and Science Bulletin 420. Albany, NY. 102 pp. Peteet, D.M., M. Beh, C. Orr, D. Kurdyla, J. Nichols, and T. Guilderson. 2012. Delayed deglaciation or extreme Arctic conditions 21–16 cal. kyr at southeastern Laurentide Ice Sheet margin? Geophysical Research Letters 39:LII 706, DOI:10.1029/2012GL051884. Rich, J.L. 1934. Glcial geology of the Catskills. Bulletin 299. New York State Museum, Albany, NY. 180 pp. Secrest, H.C., H.C. Macaloney, and R.C. Lorenz. 1941. Causes of decadence of hemlock at Menominee Indian Reservation. Wisconsin Journal of Forestry 39:3–12. Shuman, B., P. Newby, Y. Huang, and T. Webb III. 2004. Evidence for the close climatic control of New England Vegetation History. Ecology 85:1297–1310. Sirkin, L.A. 1967. Correlation of Late-glacial pollen stratigraphy and environments in the Northeastern United States. Reviews of Paleobotany 2:205–218. Stickel, P.W. 1933. Drought injury in hemlock–hardwood stands in Connecticut. Journal of Forestry 31:573–577. Webb T. III .1980 The reconstruction of climatic sequences from botanical data. Journal of Interdisciplinary History X(4):749–772.